French toast came up in conversation one day and from that point forward, it became a craving for Duc. So we decided that we'd make brinner (breakfast for dinner, the holiest of all meals) one night. Now, I had already made French toast in the past so I knew what it consisted of; however, he had been exposed to what I thought was French toast when I was young as well. You see, our Asian parents seemed to think that French toast consisted of bread slices (any kind, mind you) dipped in whisked eggs and fried with oil on a skillet. Sugar was sometimes added on top. 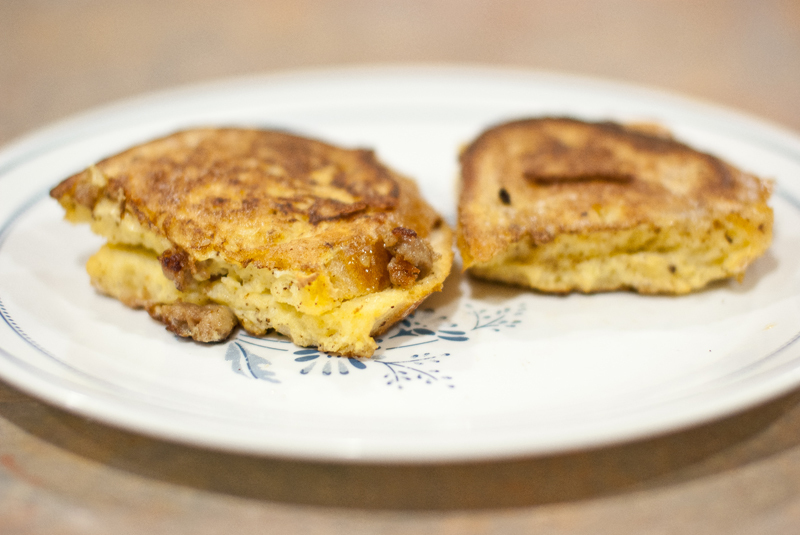 Hey, it was delicious when I was younger but then I discovered what French toast actually was and it wasn't the "fried egg bread" I had had as a child. So the mission was to expose him to actual French toast. 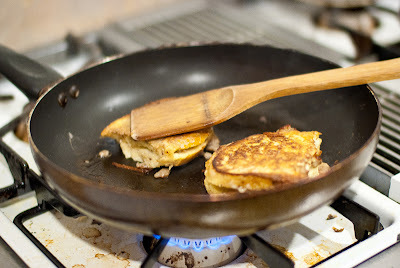 I was curious about French toast so looked up some things online and found that some people try to stuff theirs. 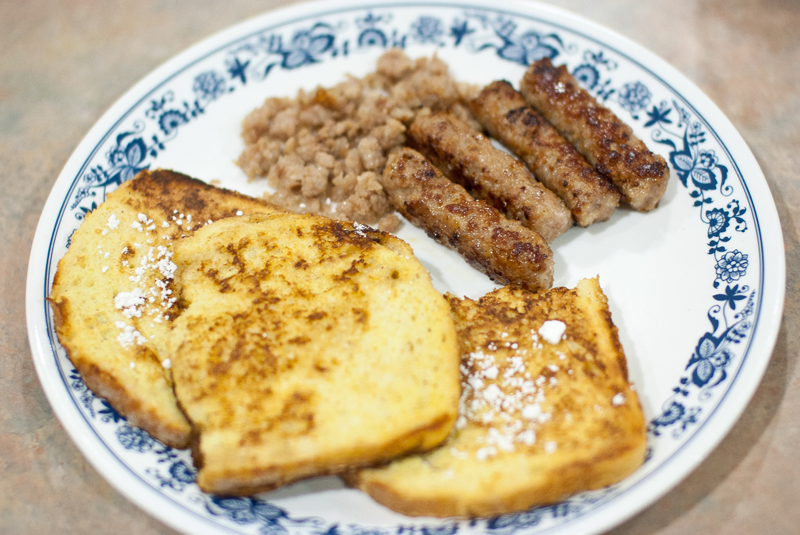 The idea of stuffing French toast with sausage and cheese was really appealing so we decided to experiment/ The result was delicious, and the recipe follows below! Note: all photos are courtesy of Duc and are obviously much more awesome than my past pictures. We actually ended up using almond milk instead of regular milk because it wasn't available. It added a nice taste to the custard but wasn't necessary. Combine the cinnamon, nutmeg, vanilla extract, milk, and eggs in a bowl and mix thoroughly. At the same time, heat up a skillet for your breakfast sausage. Cook that completely because it will not cook well between the bread when made. For our bread, we happened to get a loaf that had already been sliced thinly so we had to fold the slices in half to create the pockets for the stuffing. However, if you bought a fresh loaf that hasn't been sliced, make sure the slices are thick! 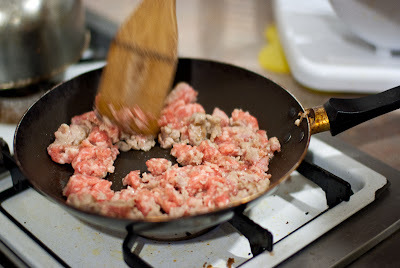 You'll want to slice about 3/4s of the way into each slice in order to create a pocket for the meat. It will make it easier for stuffing later. Heat up another skillet and add on some butter. 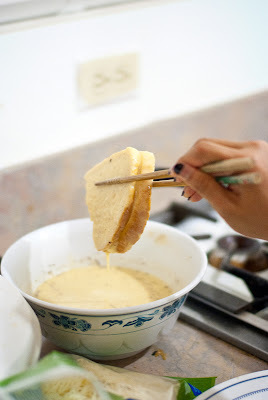 Dip the bread slices into the custard one at a time, giving a few moments for the egg to soak a little into the bread. Then place the slice onto the buttered skillet and fill the pocket with sausage and shredded cheese; the reason for not stuffing it before dipping is that you don't want uncooked egg to be stuck on the inside. You don't have to use Monterey Jack; I believe the recipe I had thought about used Swiss instead. 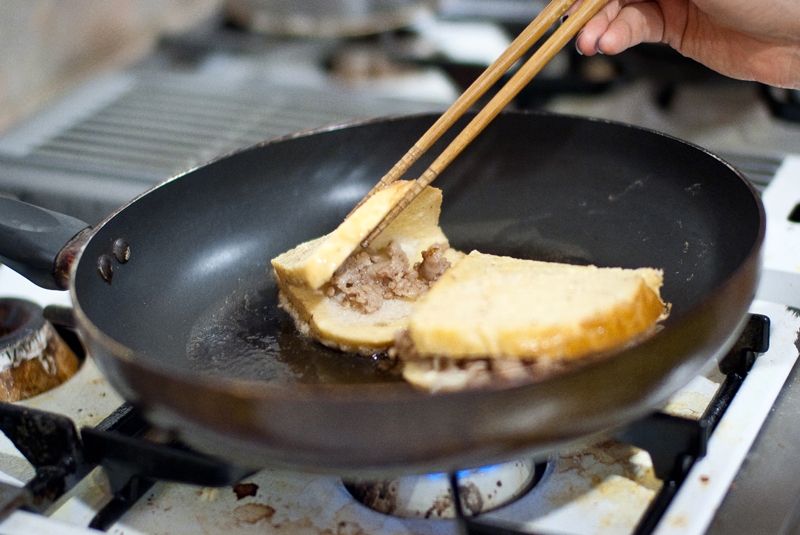 Once one side is cooked (crisp on the bottom), flip it over and cook well. You want all the egg to cook and the cheese to melt inside to hold the sausage together. Once both sides are a nice golden brown, transfer to a plate and dig in! 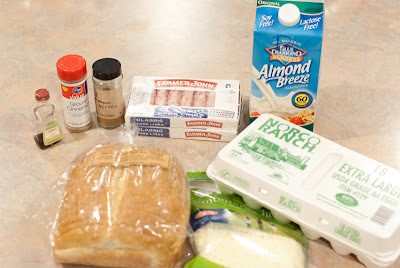 The recipe actually can be done without the sausage and cheese as well. If you do it without, you don't need to stuff the bread with anything. 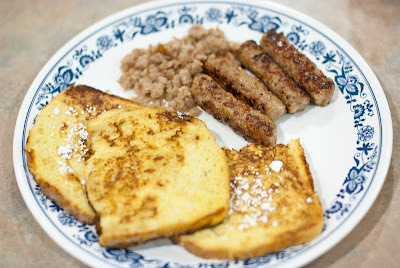 It will just be regular French toast, which is delicious as well (I topped our slices with sugar). The great thing about this delight is that the sweetness of the bread itself is contrasted very well by the saltiness of the sausage and cheese. As for the butter situation, you are free to cook the toast without buttering the skillet every time but it does taste better when fried in butter!